Kresley Cole’s Arcana Chronicles Series Hits New York Times Bestseller List! 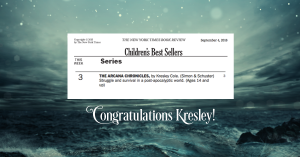 Congratulations to Kresley Cole for her Arcana Chronicles series hitting the New York Times Children’s Best Sellers list at #3! “Insidious” is a #1 New York Times Bestseller! 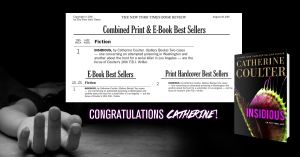 Congratulations to Catherine Coulter! Insidious debuted at #1 on the New York Times E-Book Best Sellers list, #1 on the New York Times Combined Print & E-Book Best Sellers list AND #2 on the New York Times Print Hardcover Best Sellers list! We were thrilled to work with Catherine and Gallery Books on the social media marketing campaign for Insidious! “Fatal Identity” is a New York Times Bestseller! Congratulations to Marie Force! 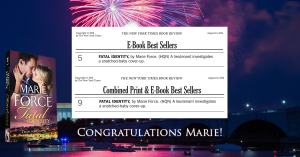 Fatal Identity debuted at #5 on the New York Times E-Book Best Seller list and #9 on the New York Times Combined Print & E-Book Best Seller list! 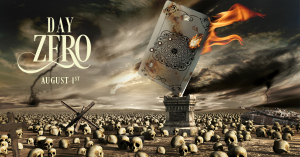 We are happy to announce that we are working with #1 New York Times bestselling author Kresley Cole on her latest Arcana Chronicles books, Day Zero and Arcana Rising! 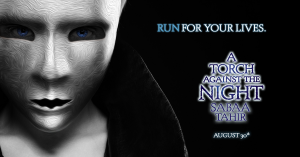 We’re thrilled to be working with Penguin Young Readers and New York Times bestselling author Sabaa Tahir on A Torch Against the Night, the sequel to her instant New York Times bestseller An Ember in the Ashes!